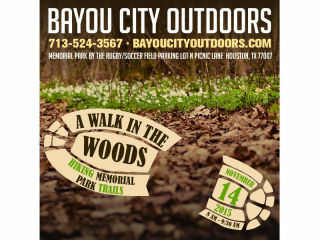 Bayou City Outdoors presents A Walk in the Woods. Memorial Park, known as the Central Park of H-town, is an amazing 1466 acre park (one of the largest in the county) right inside the loop. Trails are a mix of hard packed dirt, sand, trees and tree roots. It is wooded and wild in the middle of the city. This will be an hour and a half quick-paced hike through some of the lesser-known (and more adventuresome) trails the park has to offer. Make sure to wear tennis shoes or hiking boots to deal with the rough terrain. Remember to bring water; there are no water fountains along the trails. After the hike, a group will go out for breakfast and coffee.